Many cyclists are unable to start and stop their bikes in a controlled manner. On Bike North easy rides we often see prospective cyclists with little experience and little idea of how to start and stop their bikes. The following is a step by step procedure on how to manage this and look like a professional while doing it (note this procedure is written for cyclists with two wheeled upright bicycles). Start by standing with the bike on your right hand side. In Australia it is best to mount your bike in this way as we ride and drive on the left hand side of the road. By placing your bike on your right prior to mounting it is further out into the traffic stream than you are. Your bike should be in one of its middle/lower gears for starting depending on its gear range. Too high and it will be difficult to get moving and too low and your first pedal stroke will not provide you with sufficient momentum to get your second foot onto the other pedal. Hold the left hand side handlebar with your left hand and the nose (front) of your bike’s saddle with your right hand. Lean the bike towards you and swing your right leg forwards and over the bike frame. Now you should be straddling the bike with one foot on the ground either side of the bike. Note make no attempt to sit on the bike seat at this point of the exercise; if it is adjusted properly you will be unable to do this anyway as it will be too high. Now we are ready to roll! Place your right hand on the right hand side handlebar, apply the front brake with your right hand if necessary to steady the bike. If you have toe clips or clip-less pedals place your right foot onto/into the right pedal and move the right pedal to the two o’clock position. If you have flat pedals move the right hand side pedal to the two o’clock position and then place your foot on it. The next bit might sound tricky but like this entire process will become instinctive with a little practice. Release the brake(s), push down on the right hand side pedal (note you are not yet sitting on the saddle! ), at the same time lift your left foot off the ground. You are supporting yourself with your two hands on the handlebars and your right leg. As your right pedal comes to the bottom of its arc straighten your right leg fully and slide your bottom backwards onto the saddle, at the same time as placing your left foot onto its pedal. Now the next bit varies a little depending on circumstances. If you are riding with flat pedals you now have one foot on each pedal, your bum on the saddle and you are away, congratulations! If you have clipless pedals or toe clips you need to get your left foot into its pedal. If you are on the flat or downhill just coast until you get your left foot clipped in properly. If you are on an uphill, or for some other reason you need to build up a little momentum before clipping in then rotate the pedals a few times, either with your left foot not clipped in or on the back of the pedal. When you have sufficient momentum coast until you get your left foot installed properly. You are riding along approaching the place where you want to stop. Shift to an appropriate gear that will allow you to start again, paying attention to the terrain. Start coasting with your right pedal at the bottom of its stroke. Apply the brakes if necessary to bring you to a stop at the desired place. As the bike slows shift forward off the saddle, supporting your weight on your right leg and two arms. Unclip or move your your left foot from the left pedal and extend your left leg. As the bike comes to a halt lean to the left, so that you will be supported by your left leg on the ground as the bike stops. It sometimes helps, most people do it instinctively without noticing, to make a minute movement of the bike’s steering to the right just prior to stopping. This has the effect of ensuring that the bike leans to the left. As the bike stops you should be applying one or both of the brakes so that between the bike’s two wheels and your left leg you have a stable platform on which to support yourself. If you are not going to dismount, lift your right pedal to the two o’clock position. You are now ready to start again from step 5 of the starting procedure. If you are going to dismount then unclip or otherwise remove your right foot from the right hand side pedal. Place your right hand on the nose of the bike’s saddle and, with your left hand applying the bike’s rear brake, swing your right leg forwards and over the bike’s frame. You now should be standing with two feet on the ground and your bike on your right hand side. Other people may have alternate methods of starting and stopping but the above technique works under all circumstances and is the one beginners should seek to master first. 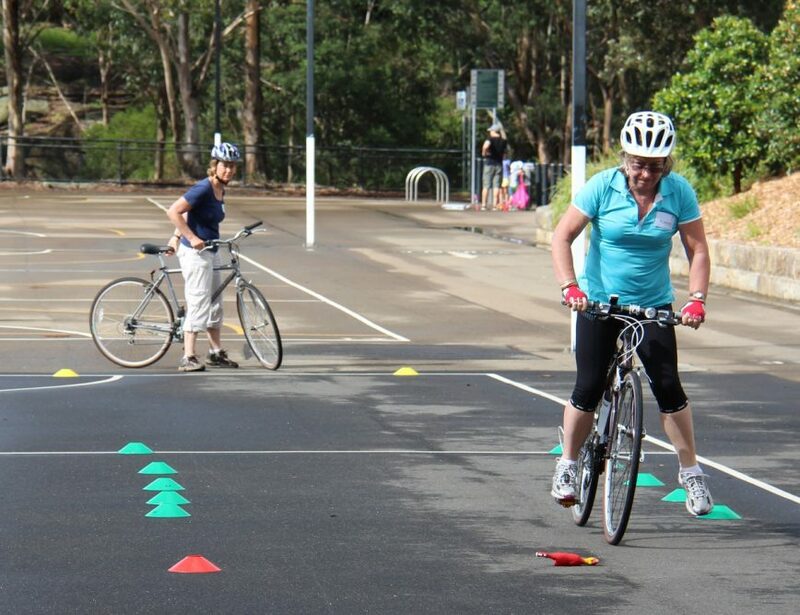 It is also possible to reverse the technique so that you are starting and stopping with the bike on your left; however, the technique as described is better suited to riding in Australia where we ride/drive on the left hand side of the road.